A Geography undergraduate student recently shared with me his observation that Esri’s ArcMap application was looking incredibly old and out of date. He was a student in an introductory Cartography course. His words brought back memories of my own experience in a Cartography undergraduate course 10 years ago. At that time, ArcMap version 9 was relatively new, but my class performed GIS tasks (shapefile edits and exports) in ArcView version 3. I remember thinking about how dated ArcView looked to me then and wondering why I was spending time learning an outdated piece of software. Well, students are beginning to have similar thoughts about ArcGIS 10. And much like my experience learning ArcView while ArcGIS was widely used in the professional world, academia’s adoption of Esri’s latest desktop GIS solution, ArcGIS Pro, has been slow. Esri describes ArcGIS Pro as the centerpiece of the ArcGIS platform (Esri, 2016a), while taking care not to declare it a replacement for ArcMap and its associated products (Esri, 2016b). Esri released ArcGIS Pro version 1.0 22 months ago in January 2015 (Elkins, 2015). The latest version, ArcGIS Pro 1.3.1, arrived in July 2016 (Garrity, 2016). Both ArcGIS Pro and ArcGIS for Desktop (which includes ArcMap 10 and associated products) are currently offered in parallel by Esri. Pro boasts an updated look and feel to its user interface that could be described as modern. On the other hand, long-time devotees of ArcMap might describe it as radically different. Beyond the user interface, Pro has yet to achieve the full functionality of ArcMap but gets a little closer with each updated release. As Pro continues to creep up on ArcMap in terms of functionality, I have been increasingly feeling the need to begin learning the new product. As an administrator of my campus’ Esri site license, I also want to be knowledgeable and conversant about its strengths and weaknesses. Over the 2016 summer period, I began working to familiarize myself with ArcGIS Pro, and since then, I have used it for a few small GIS projects for my library. I shared my thoughts on the process of learning ArcGIS Pro at the 2016 WAML annual meeting in September at Stanford. I was not too surprised to learn that very few of my WAML colleagues had begun working with Pro. The following article is a continuation of my presentation at the WAML meeting, and I will elaborate on some of the impressions I shared there. The objective of this article is to introduce the IB readership to ArcGIS Pro, provide an overview of the product’s strengths and weaknesses, and discuss the implications of this new application on teaching and learning GIS. Hopefully this introduction will ease any inhibitions Map and GIS Librarians have about Pro and encourage IB readers to take it for a spin. 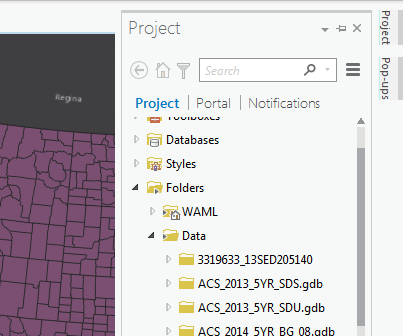 Open up ArcGIS Pro and the first thing you are likely to notice is an interface that looks oddly familiar. Users of Microsoft Office tools will recognize that Pro deploys a ribbon-style toolbar across the top (Figure 1). The ribbon prominently displays the most frequently used tools in a context-based organizational scheme. Much like Microsoft Word groups complimentary tools on tabs then subgroupings (e.g. 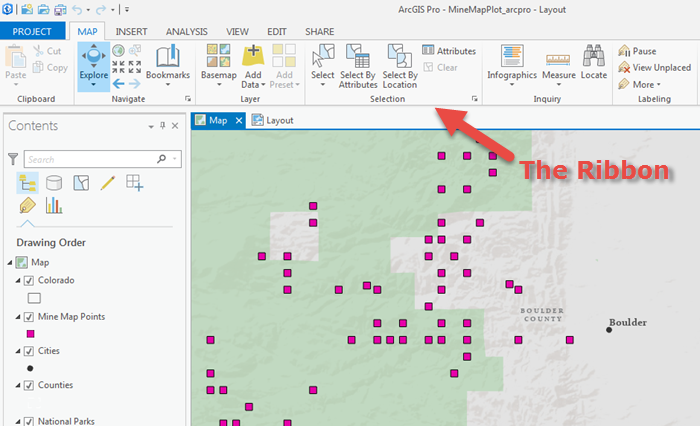 subgroups of Tables, Illustrations, and Text are found on Word’s Insert tab), the ArcGIS Pro ribbon features Map, Insert, Analysis, View, Edit, and Share tabs. Figure 1. The ArcGIS Pro user interface. Note the Microsoft-style ribbon across the top. Compared to ArcMap 10.4, tools are much larger and easier to find, although they take up noticeably more screen space (it is collapsible, however). A big improvement here is the ability to locate and access the Geoprocessing Tools, which are nicely visualized on the Analysis tab (Figure 2). Users of ArcGIS Online will probably notice some similarities in Pro, and the new application makes publishing to an online account more seamless by way of the Share tab. Figure 2. Top: The comparatively small toolbar items in ArcMap 10. Bottom: The easy to find geoprocessing tools on the Analysis tab in ArcGIS Pro. Esri has also taken steps to improve working in Layouts in ArcGIS Pro. In ArcMap, simply accessing the Layout view can be a stumbling block to new GIS users. When teaching or providing a GIS consultation to a student or new GIS user in ArcMap, I frequently find that I have to make special note of how to access the Layout view. I emphasize this point because the simplest way to switch from Data to Layout view in ArcMap is by clicking a miniscule, and easily forgotten button on the bottom left of the canvas. In Pro, the user simply clicks the Insert tab on the ribbon to find the New Layout button, then the Layout will be available on a new tab above the main canvas (Figure 3). By design, users of ArcGIS Pro will find themselves on the Insert tab frequently to create a new map, quickly reinforcing the practice of adding new views to the project (more on workflow below). 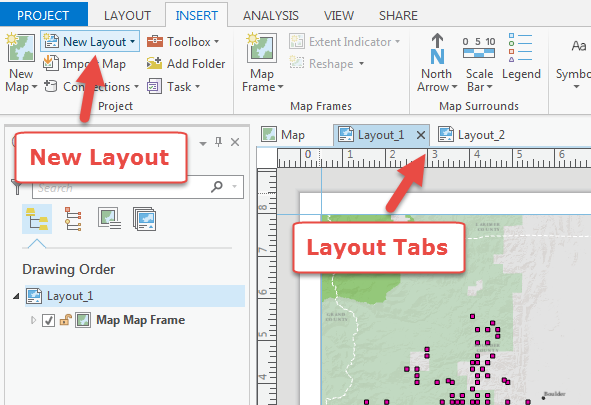 ArcGIS Pro also supports multiple layouts, a feature unavailable in ArcMap. Now, users can create multiple map layouts from the same source data and save each of them in the same project file rather than using a Map Series or multiple MXD files. Figure 3. The layout view is easy to access from the Insert tab in ArcGIS Pro. Figure 4. The Project Pane is accessible via the vertical tab on the right side of the application. In ArcGIS Pro, work is saved in a Project File (.aprx) rather than a Map Document (.mxd). When starting a new project, the user is prompted to name and save the Project File from the onset. During this process, ArcGIS Pro creates a new folder for the Project File, default geodatabase, and all other associated files to reside in. In other words, the user is prohibited from working in an unsaved session. This feature should help users that tend toward disorganization –a common problem for new users or students. I consider this a sort of built in best practice. On the other hand, as a librarian who provides desktop and data support to students, I find the process of saving a new project file on each occasion a bit cumbersome. For example, an ordinary process for me is to help a student with a quick procedure like joining a table to a shapefile on my personal computer or a shared machine then simply pass off the exported data to the student on a flash drive. For these types of quick data manipulation services, I have found myself sticking with ArcMap so I can work in a sort of “burner” map document –saving a project is just not necessary. That said, most users are not in my position and saving early and often is a good thing. A major shift from current and past versions of the ArcGIS desktop applications to ArcGIS Pro is the absence of associated applications such as ArcCatalog, ArcGlobe, and ArcScene. Instead, all of these tools are rolled up together in Pro –kind of. ArcGIS Pro’s nearest equivalent of Catalog is the Project View and Project Pane. Like the Catalog Tab and Pane combination available in ArcMap 10, users browse through their files and data in the Project Pane in Pro, which is accessible via the Project Tab on the right side of the application (Figure 4). For a less cramped view of a project’s data files, users can add a Project View by accessing the View tab from the ribbon, then selecting Project View under Project (Figure 5). The Project View places a new tab on the main canvas area much like the Map and Layout tabs. If, like me, you often work with ArcMap and ArcCatalog open in tandem on dual monitors, you can drag and drop the Project View tab to a standalone window. The Project View is also the location for viewing metadata. ArcGlobe and ArcScene functionality is accessible by adding a new scene under the Insert Tab. New Scenes are Global by default, but users can convert a Scene to local view to create 3D visualizations of buildings or terrain. Figure 5. Project View is as close as it gets to ArcCatalog. In terms of performance, ArcGIS Pro has an advantage over ArcMap 10. The main performance difference between ArcMap 10 and ArcGIS Pro is that the former is a 32-bit program while the latter is a 64-bit program. A 32-bit program like ArcMap 10 can typically only access a maximum of 4 gigabytes of a computer’s RAM. The ArcGIS 10 suite of programs was designed to run on a 32-bit operating system. These days, however, most GIS or Map Librarians are probably working on computers equipped with a 64-bit operating system and double or quadruple the amount of RAM. My own work machine runs 64-bit Windows 7 with 16 gigabytes of RAM. ArcMap can still operate on a 64-bit computer, but it can only access a maximum of 4 gigabytes of RAM. In simple terms, when I run ArcMap on my computer it can only use a quarter of the machine’s RAM –limiting it’s processing speed. ArcGIS Pro, on the other hand, can take full advantage of the extra memory. The speed boost is noticeable when working with a large dataset. If you happen to have both ArcGIS 10 and ArcGIS Pro installed on your computer, you can see the difference for yourself by loading one of Esri’s basemaps. The draw time for Pro is much faster, and navigating the basemap has considerably less lag-time. Figure 6. After signing out then working in ArcGIS Pro for a while, I received this dismal message. License provisioning of ArcGIS Pro may cause some problems for librarians and administrators. Following my presentation at the WAML meeting, Susan Powell of UC Berkeley brought up the issue that users are prompted to log into their campus ArcGIS Online account upon launching the application. The default license provision for ArcGIS Pro is a Named User license, or in other words, that person’s campus ArcGIS Online account. The license is tied to a user’s ArcGIS Online account with your organization. If an organization administrator has authorized ArcGIS Pro use for that user’s account, then signing in will allow that person to run the application (Esri, 2016c). If the user’s account has not been configured or she does not have an account with your campus ArcGIS Online organization, ArcGIS Pro will only run for 60 minutes (Figure 6). Following this scenario, every student on campus who wants to use ArcGIS Pro needs an account. However, Esri also offers two other licensing options: single and concurrent use. Single use licenses are unique licenses for individual machines, while concurrent use licenses allow the user to “check-out” a license for a particular session (Esri, 2016d, 2016e). These options, combined with some planning, may solve the problem of running ArcGIS Pro on laboratory machines without an ArcGIS Online account. ArcGIS Pro also lacks the full functionality of ArcMap. There are several toolboxes that are not yet available, including coverage tools, parcel fabric tools and others (Esri, 2016f). There is also a long list of tools from other toolboxes that have not been added to Pro. Many cartography tools are missing and nearly 50 data management tools have not made it into Pro. As a librarian, I have not yet found myself in a situation where the absence of a tool has impeded my work. With that said, I could imagine some of these missing tools creating a problem for researchers at my institution that use GIS heavily. I have also encountered a few software bugs. Recently I was attempting to overwrite a web layer from ArcGIS Pro but the analyze and publish buttons were mysteriously grayed out. After searching and posting on the Esri Geonet Forum, I came to the realization that a software bug was the culprit. Release notes for version 1.3 provide a list of known issues that Esri developers are working to resolve. It is safe to consider ArcGIS Pro a work in progress, albeit a highly functioning one. Overall, I have enjoyed learning my way around ArcGIS Pro. My general impression is that the updated interface is a real improvement. For seasoned GIS users, relearning how to accomplish the same tasks they have carried out for years in ArcMap will probably cause some consternation. For students or new users, however, the usability updates will likely reduce the barrier of entry to GIS –and who can argue with that? Each iteration seems to result in more features and fewer bugs, and I look forward to the application gaining the functionality of ArcMap. I plan to begin offering introductory workshops for students and faculty on my campus beginning in the Spring 2017 semester. My library is also purchasing new computers specifically for workshop use which will have ArcGIS Pro installed. I will be working in the coming months to ensure the licensing for Pro on these machines is configured in a way that does not restrict access. If you are curious about how my work bringing ArcGIS Pro to my campus goes, then check back with me in a few months!